Studied Medicine at Monash University, Australia. Currently saving lives in Malaysia. Currently a Senior Associate in the CEO's Office at PNB, Msia. Studied Medicine at the University of Cambridge, UK. Currently saving lives in Birmingham, UK. Studied Aerospace Engineering at International Islamic University Malaysia. Currently doing a PhD in Aerospace Engineering at Cranfield University, UK. Electrical Engineering at University of Illinois Urbana-Champaign, USA. Currently an Audit Associate at BDO, Msia. Studied Law (LLB) at International Islamic University Malaysia. 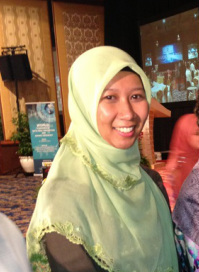 Previously an Associate at Zaid Ibrahim and Co. Recently graduated from Durham University with an MA in Islamic Finance. Studied Engineering and Computing Science at the University of Oxford. Completed her PhD in Nuclear Engineering at the University of Cambridge. Currently working at the Regulatory Economics and Planning Division of TNB, Malaysia. Human resource development is something we often take for granted. Yet the genius is not in the product, but in the people who make it. Consequently, investing in people should be more important than investing in the product itself. This is what we need to keep in mind when we want to build a successful ummah. Akademi Dr Zara focuses on young children, who are at the precipice of understanding the world around them and their path in life. The main aim of the Akademi is to motivate these children to realise their potential, thereby giving them confidence in their own abilities. Armed with this courage and the right guidance, children are then able to go out and make their own successes, find their own rezeki and one day contribute to the society they live in. The Akademi promotes motivation and education based on the teachings of Islam. This is because the west has somewhat successfully ingrained in many of us the idea that religion and state are separate and the two have no correlation with one another. Most of us, especially our children, feel that Islam is confined to the borders of schools and mosques. But the opposite is true. In fact, Islam is a way of life that teaches us how to be successful in this world and the next. This material success must always be balanced with spiritual success. The Akademi is not the product of one person, and hence there is no primary ustaz at the head of the Akademi. Instead, the Akademi derives its resources and expertise based on the collective ummah. We feel that the responsibility of helping our children does not fall upon the select few, but it is at the very core, a community project. The children in our community are our children too, and we must help nurture them like our own. 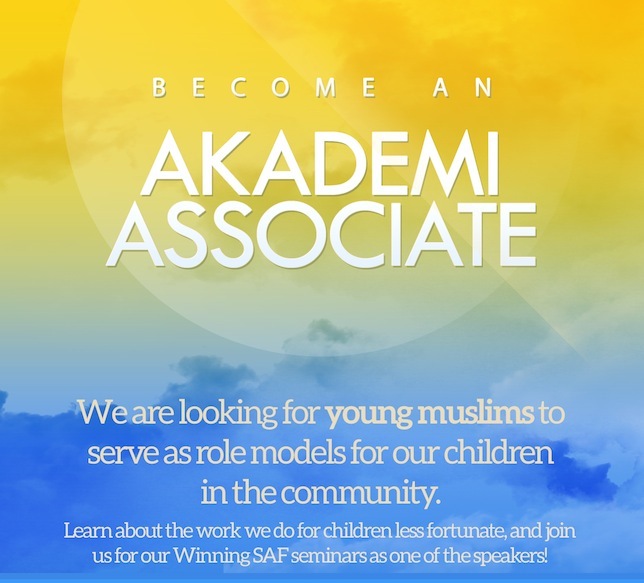 The Akademi derives its strength from the Akademi Associates that are a collection of young Muslims that understand their responsibility of giving back by serving as relatable figures that the children can look up to. This is the bare minimum that an associate contributes to the Akademi. The gift of Hidayah lies only with Allah s.w.t.. All that we are capable of doing is to convey the message, to as many people as we can. Hence the measure of our success in the work we do here will never be quantified, until the Day of Judgment. Nevertheless, we do what we must, and Insya’allah, with Allah’s barakah, the Akademi will grow with or without us, if its work is good and sincere. ﻿﻿Email us﻿﻿ for more information on becoming an Akademi Associate and join our seminars to give short talks to the children, especially those from less fortunate circumstances. We often underestimate the power of a few minutes that one spends with a child who doesn't have the guidance, love and support that one gets from family.